Beauty Expo Australia 2017 | [All Things Tanning] For Tan Fans! Beauty Expo Australia is a Trade Only event for those within the beauty industry. The event offers exhibitors and visitors the opportunity to connect, buy, sell and source from a number of new and leading brands. Beauty Expo Australia provides industry professionals with a unique forum in which they can try and touch new products and innovations in an experiential environment. Featuring the Nailympia Australia Competition, the Face2Face Makeup Awards and the Dermal Therapy Conference, makes Beauty Expo Australia not just a national show but an international show for professionals within the beauty industry. 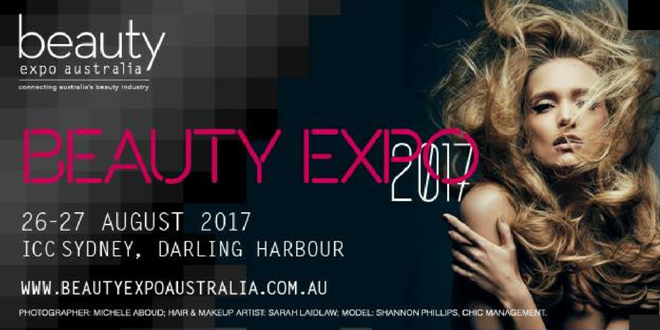 Beauty Expo Australia returns to Darling Harbour in 2017. With the opening of ICC Sydney, Beauty Expo Australia is pleased to announce the move back to Darling Harbour in 2017. The new, world-class ICC Sydney is positioned in the heart of Darling Harbour and only a moment’s walk to Australia’s largest CBD. Opening in December 2016, ICC Sydney is Australia’s first fully-integrated convention, exhibition, events and entertainment centre. Featuring a striking contemporary design, leading technology and world-class meeting and exhibition spaces, ICC Sydney is at the heart of its very own waterfront precinct, set amongst restaurants, retail and a vibrant public domain. “I began researching the ingredients in the products we were using and I did not like what I found… I wasn’t prepared to use these products on my own skin and was even more concerned about the risk they posed to by sister. It was in these very moments that Eco Tan was pioneered”. In 2010, Eco Tan made Australian history by being the first tan to use organic ingredients Certified by the Organic Food Chain. Five years later Eco Tan and, by extension, Eco By Sonya Driver continues to pioneer game changing products for the natural beauty and body care industry. Now available across the globe, Eco Tan and Eco by Sonya Driver have started to make a global impact. Made by an Aussie mum with love and integrity, we are proudly Certified Organic, 100% Natural and Certified Toxic Free by Safe Cosmetics Australia, Accredited Choose Cruelty Free and Licensed by PETA. Using a Certified Organic skin care range really does make a difference. After all, your skin is your largest organ and much of what you put on it gets absorbed into the bloodstream. Whether you prefer your self tan to be express or slow-building, Eco Tan promises you the most beautiful, believable bronze for all complexions, with NO hidden nasties. Guaranteed! GlowByBeca Providing You With More Than Just A Tan! Inspired by Endless Summers and Touchable Skin GlowByBeca, raising the bar in sunless tanning, assuring a Salon quality finish for home use. Our range is 100% natural, Australian Made and PETA approved. Both Professional Spray on solution and our self-tanning products are a chocolate ash based, fast drying and odourless. GlowByBeca is rich in vitamins and organic oils to hydrate your skin leaving you with nourished skin and a longer lasting tan that glows. “The Official Tan Partner Of The Bachelor & Bachelorette AU”. These Australian designed products are about style, comfort and a ‘must have item’ of clothing that will allow a flawless spray tan to develop. Everybody wants the best out of their spray tan and our garments are specifically created to ensure your clients gain the best possible tanning experience. The fabric feel is soft and smooth against the skin, they are lightweight and designed for comfort and thick enough for appropriate cover. The neckline has an extra wide cut and a heat print label to keep the garment as seamless as possible. We also have jersey and other fabrics for cooler months. Offer your clients an add on product in your salon for those who spray tan. Kaf.Tanned is a great addition for the beach as well. Come and meet the Kaf.Tanned team at stand G148 and take a look at their tanning apparel. Natural Look’s comprehensive Australian Made and Owned hair and beauty range offers Skincare, Depilatory Waxes, Manicure, Pedicure, Sunless Bronzing, Complete Hair Care, Styling And Professional Colour. All Natural Look Products are especially formulated to meet the needs of professional beauticians and hairdressers. We welcome you to experience a new era in luxury tanning. Enhanced with coconut water Royalty Society Tanning Solutions are hydrating, long lasting and fade evenly surpassing expectations. A high quality Australian Made and Owned product with unrivaled results. Choose ethically; 100% Vegan and Cruelty Free, made in a PETA approved facility. Solaire®: 7 Years in a row the Solaire® – the spray tan specialists have been finalist or have won the Bridal Industry Awards. Solaire® spray tan solution continues to collect accolades that are second to none! Solaire® spray tan solution system is the industry’s most awarded spray tan. Mediterranean Tan®: Scientifically formulated to clinically outperform. Chosen by Miss Universe® Australia as the official tan 2012-2016. All of our products are manufactured in a pure organic environment, with exotic ingredients. We are PETA approved as Cruelty Free and Vegan. Solaire® Purely Sunless Automatic Booth: You can now choose from a standard 8 hour or 2 hour solution, in either Green Base, Violet Base, or Red Base Solution / Dry Oil Spray Tan within our Solaire® Heated Purely Sunless Automatic Booth. With Solaire®’s Purely Sunless Automatic Booth, this transcendental moment can now happen in just 4 minutes. Santorni Smile® Teeth Whitening: Salons, Home salons and mobile therapists – Add thousands of dollars of revenue to your business instantly! Santorni Smile® take home kits – Dental Grade ingredients, Medical Industry Designed. PETA Approved. DELIVERS RESULTS. A gorgeous Smile! Sunescape Tan is born in Bondi, made in Australia, a professional sunless tanning range, including an in-salon spray tan solution, and a complementary at-home retail range for your clients to be beautifully bronzed 24/7. Named after the ‘just got back from holiday’ result it embodies, and developed alongside award-winning Tan Temple, you can’t escape the glow when Sunescape offers a range of natural looking shades, with a proprietary formula that enhances your skin and nourishes with powerful natural ingredients, people will be asking you “where have you been?”. Our take on that post-holiday glow, without the damage to your skin, Sunescape is literally a tropical sun escape. Enriching your skin with anti-ageing, hydrating and skin firming ingredients, plus a certified natural DHA formula, leaves your skin smooth and replenished. Australian Owned and Made, Sunescape is recognised for its signature coconut vanilla scent and tropical style. Our range of products contain ingredients like Coconut, Vitamin E and exotic Macadamia Nut and Avocado Oils that make Sunescape one of the most hydrating tans for your clients in salon and at home. Nobody wants a tan that looks like you’ve had a spray tan… While other fake tan formulas result in dryness and streaking, Sunescape’s natural ingredients, in addition to being Alcohol, Paraben and Cruelty Free, promise to give clients the best spray tan possible, one that feels (and smells) as good as it looks. TechnoTan is Australia’s leading spray on tan product and service provider and one of the most requested spray tan solutions in beauty salons and home studios across the country. TechnoTan are recognised for both product quality as well as business support and present a complete offering for spray on tan related products. TechnoTan use the finest naturally derived, organic ingredients available for pre-tan preparation, after-tan care and tan enhancement. The ECOCOCO girl is free spirited, passionate and confident in her own skin. Always seeking adventure and forever chasing the sun, you will always find her with a smile on her face and a sparkle in her eye. At ECOCOCO, we truly believe in the power of 100% Certified Organic Coconut Oil, which is why all of our unique formulations contain this miracle ingredient. We will always strive to deliver innovative products that empower women to look and feel their best in a healthy and natural way. We use many Certified Organic ingredients in our formulations to ensure there is a balance between organically natural and beneficial ingredients. We stand proud that our products are not tested on animal and our Tan and Body Scrub ranges are both Vegan. The entire ECOCOCO range contains a high percentage of Natural and Certified Organic ingredients and none of our products contain any added Sulphates or Parabens. Stand: H136 With over 25 years experience in the beauty industry, Leah Light and OMG Beauty Solutions are committed to providing only the best products to nail and beauty professionals. – MineTan Stand: A119 International Beauty Supplies has been importing and distributing international brands of nail and beauty products to the professional beauty market throughout Australia since 1988. To ensure products are available throughout Australia there is a network of trade distributors authorised to stock and sell our various products and to ensure the same service and support to the beauty professional everywhere. Visit Expo Tanning Exhibitor Directory For More Information and Floor Plan.